What is it that makes a diamond? First discovered in India, diamonds were originally used unpolished and in their natural crystal form. In the 14th century, European craftsmen began cutting a flat surface on the top of certain stones. Because the most prevalent form of rough diamond crystal is the octahedron (like two pyramids joined at the base), this cut produced a square diamond with broad reflective surfaces. This was known as the Table Cut. The Table Cut was not improved on until the 16th century, with the introduction of the Dutch Rose Cut. This dome-shaped diamond cut featured 24 facets, all rising over a flat lower surface. A century later, the Mazarin Cut and the Single Cut evolved – the first to include cuts to both the top and bottom halves of the diamond crystal. Featuring 17 facets (nine over the girdle and eight below), the Mazarin Cut was a major step in the evolution of the modern-day round brilliant, with its 58 polished facets. The first diamonds with 58 facets were developed in the late 17th century. Cut closely to the shape of the rough octahedron, the Old European Cut and the Old Mine Cut stones had a more square appearance than modern diamonds. Their overall look was also markedly heavier, with a substantially heavy crown. Later, the outline of these stones was changed to a more perfectly round shape, resulting in the birth of the modern Round Brilliant Cut and the four C's grading system. The color grade of most gem-quality diamonds is based on the absence of color. The carat, the standard unit of weight for diamonds and other gemstones. A diamond's cut grade is really about how well a diamond's facets interact with light. 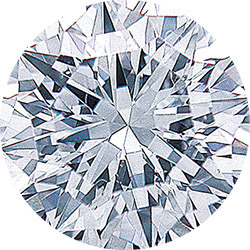 The Eighternity Diamond is a Modified Round Brilliant.